This is the third in a series of How to Swagbucks 101. 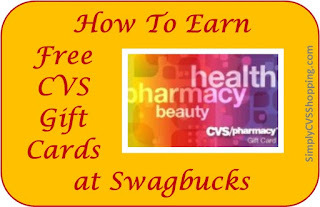 Swagbucks is one of our favorite ways to earn free CVS gift cards. It is possible to earn a few or many dollars in CVS gift cards each month thru online activities. They offer dozens of different major retailers' gift cards including: Walmart, Ebay, Kmart, Amazon and Target but my favorite, of course, is the CVS gift card. Third party survey sites run the surveys. "Gold surveys" offer surveys chosen for your demographic. If you do not qualify for a survey you will receive one SB. Earnings: From 50 SBs & up to a few hundred per survey. Find link to gold surveys as "Answer" in left side bar on Swagbucks homepage. There are often some on the homepage, too, under "Answer Surveys & Earn." Time: From a couple of minutes to 30 or more minutes. The longer the survey the greater the reward. Sarah has done several just a few minutes long and received 50 to 100 SBs. Free Special Offers ... found on homepage or thru link "discover" in sidebar of homepage. Go thru the several links in the sidebar on the discover page -- there are several different third party companies offering rewards. Some of the activities include the following. "I'm done" link at top. There are usually lots of these...often under the "Peanut Lab" or "Radium One" tabs -- choose to sort them from least earnings to most. They are usually just one or two points. Go thru the links and click thru slideshow or scroll thru article as instructed to earn. Earnings: usually one or two. Time: 10 seconds or more depending on length. Plus the time to find them. These are found on the homepage and the various links on the discover page as noted above. Earnings: usually one to two. I cannot currently get on this -- I have read of many people having issues with it on laptops. But from what I remember you click and let the page load and there is a countdown clock, then you click next, there are ten pages I think in each set. Find "Daily Crave" link in left side bar on Swagbucks homepage. Time: I think each page stays up for 30 seconds, but I can't remember for sure. Total Earnings Possible for Category #4 varies greatly depending on time spent. The items with countdown clocks or videos are good to have playing while you are working on something else. Depending on the time spent you can earn hundreds in free CVS Gift Cards each year. We used to only earn CVS gift cards for our personal CVS shopping, but now we enjoy earning free gift cards for shopping to fill shoe boxes for kids in need (see our shoe box packing journey at Simply Shoe Boxes).